"Great Trails, More Snow And Continuing Frigid Temperatures In The Northern Forest!" Weather wise, it was another crazy week with frigid temperatures and a high of plus one. We got two days of fresh new snow. We were very lucky here with the last snow storm as the areas south of us got freezing rain and then rain. That coupled with a quick drop in temperatures turned everything into an icy mess. Here again due to the temperatures, we only got in three days of running. However, they were quality runs on great trails. The puppies are growing quickly and are now completely weaned from Flaire and eating solid food. None too soon for Flaire as she tired of nursing the pups, especially with their sharp teeth. My Handlers, Chloe & Leo, had some friends of theirs from Virginia, USA come here to visit for a few days and experience life here in a remote setting at Dog Mushing Kennel. Here are also some photos of the dogs running here on Friday. 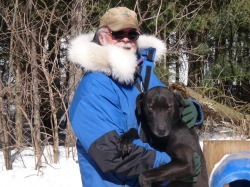 "More Snow, More Frigid Temperatures And More Running Dogs In The Northern Forest!" This past week was what is now the new norm here with extreem temperature fluctuations and snow. However, it was a good week running dogs getting in three days of running two teams per day. Two 10.5 mile runs and one of 7.5 miles. The Monday run was very fast with ideal trail and temperature conditions. The video above is of the last few miles of the "A" Teams run on Monday. Little Lilly is continuing to impress at Lead showing strong desire, speed and enthusiasm. She has even learned the commands of Gee/Haw. Both Chloe & Leo got to run a Two Dog Team this week and are learning quickly. The trail this week was much faster and the temperature very cold making for a fun but frigid run. The puppies are growing fast, starting to eat solid food and very active. We had to raise the walls on the puppy pen as they were escaping climbing over the wall. We will see how long this contains them. "First Week Of 2019 Here In The Northern Forest!" The first week of the new year was back to training on some new snow. We got about 8' of fresh snow early in the week enabling us get in three days in a row training. One run of 10.5 miles, one run of 7.5 miles and the final run of 4.5 miles. The last days run of 4.5 miles was broken up into three teams with the "A" Team running as a 10 dog unit. We broke up the balance with two Two Dog Teams giving Chloe & Leo an opportunity to experience running dogs. The temperatures were crazy again this week with a low of -32c to a high of +4c. The puppies are walking around without any problem now and having playtime with each other. A puppies life: play, eat & sleep. Sorry no video this week as having a problem with my web page provider.